Steelpan was taken to the next level with the launch of Pan Jam, a fully immersive steel pan music platform brought to life by local design agency, Dingole Ltd.
Professional pannist Tevin Shockness, performed the National Anthem on the prototype which was officially unveiled at Soft Box Studios, Alacazar Street, St Clair on April 5. The prototype’s key features were highlighted, including a tenor pan demonstration played against the virtual setting of a Caribbean island. 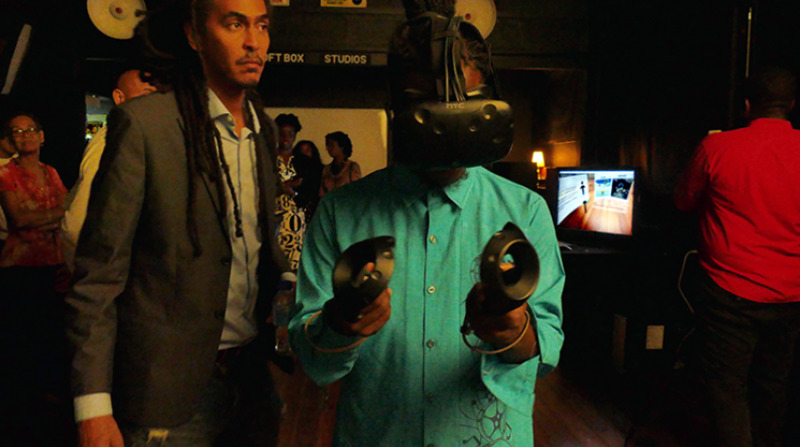 Attendees were also treated to a tour of the Virtual Steel Pan Museum, which contains a comprehensive timeline of the birth and evolution of steel pan in Trinidad and Tobago. Through the use of HTC vive, hand controllers become virtual pan sticks that, when struck against virtual steel pans, resonate a range of tones synonymous with the real instrument. Musical notes then appear in 3D space, completely immersing players in a “Carnivalesque” visual sound-dance that represents the melodies, rhythms and chords of a particular musical selection. It’s anticipated that Pan Jam, once completed, will assume its place among successful game titles like Guitar Hero, Rock Band, and Dance Central which transport the gamer into a virtual musical world. The project was made a reality through a collaboration with the US Embassy. Shawn De Freitas, Director at Dingole said the virtual experience will allow people all over the world to experience what it is like to play and learn steel pan.